Contact us at 727.656.6569 to order another size. Make every gust count! The Skate TE is for all of your out-and-out freestyle windsurfing moves. You will learn tricks quicker, be more consistent with all your moves and execute with greater style with the Skate. 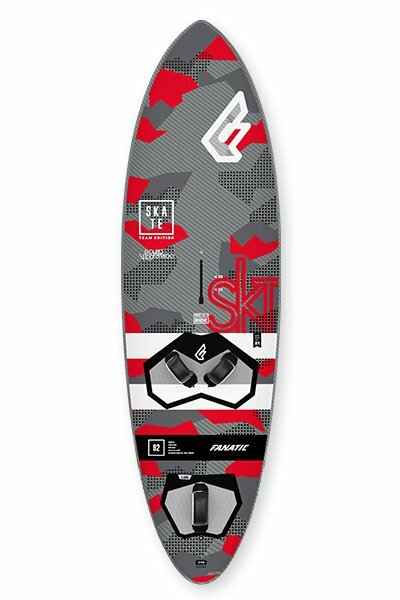 From learning your first upwind 360 to landing spocks and konos - the Skate will take you where you want to go. Designed to get planing quickly, the fast rocker line makes sure you have the speed you need going in to tricks. You will appreciate the reduced area in the nose of the board in aerial and spinning moves when you really notice the reduced swing weight. When windsurfing back and forth isn't enough any more, it's time to get a Fanatic Skate and move into the world of freestyle windsurfing!